The thyroid is a gland at the base of the throat near the trachea (windpipe). It is shaped like a butterfly, with a right lobe and a left lobe. The isthmus, a thin piece of tissue, connects the two lobes. A healthy thyroid is a little larger than a quarter. It usually cannot be felt through the skin. Thyroid nodules are common but usually are not cancer. Your doctor may find a lump (nodule) in your thyroid during a routine medical exam. A thyroid nodule is an abnormal growth of thyroid cells in the thyroid. Nodules may be solid or fluid-filled. When a thyroid nodule is found, an ultrasound of the thyroid and a fine-needle aspiration biopsy are often done to check for signs of cancer. Blood tests to check thyroid hormone levels and for antithyroid antibodies in the blood may also be done to check for other types of thyroid disease. Thyroid nodules usually don't cause symptoms or need treatment. Sometimes the thyroid nodules become large enough that it is hard to swallow or breathe and more tests and treatment are needed. Only a small number of thyroid nodules are diagnosed as cancer. There are different types of thyroid cancer. Papillary thyroid cancer: The most common type of thyroid cancer. Papillary and follicular thyroid cancer are sometimes called differentiated thyroid cancer. Medullary and anaplastic thyroid cancer are sometimes called poorly differentiated or undifferentiated thyroid cancer. See the PDQ summary on Unusual Cancers of Childhood Treatment for information about childhood thyroid cancer. 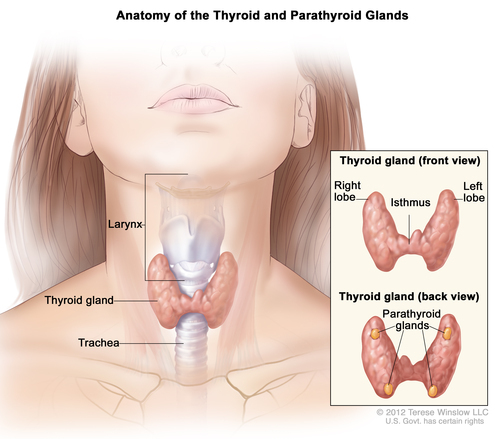 Age, gender, and being exposed to radiation can affect the risk of thyroid cancer. Being between 25 and 65 years old. Being exposed to radiation to the head and neck as an infant or child or being exposed to radiation from an atomic bomb. The cancer may occur as soon as 5 years after exposure. Having a history of goiter (enlarged thyroid). Having a family history of thyroid disease or thyroid cancer. Having certain genetic conditions such as familial medullary thyroid cancer (FMTC), multiple endocrine neoplasia type 2A syndrome (MEN2A), and multiple endocrine neoplasia type 2B syndrome (MEN2B). There is a genetic test that is used to check for the changed gene. The patient is tested first to see if he or she has the changed gene. If the patient has it, other family members may also be tested to find out if they are at increased risk for medullary thyroid cancer. Family members, including young children, who have the changed gene may have a thyroidectomy (surgery to remove the thyroid). This can decrease the chance of developing medullary thyroid cancer. A lump (nodule) in the neck. Physical exam and history: An exam of the body to check general signs of health, including checking for signs of disease, such as lumps (nodules) or swelling in the neck, voice box, and lymph nodes, and anything else that seems unusual. A history of the patient’s health habits and past illnesses and treatments will also be taken. Laryngoscopy: A procedure in which the doctor checks the larynx (voice box) with a mirror or with a laryngoscope. A laryngoscope is a thin, tube-like instrument with a light and a lens for viewing. A thyroid tumor may press on vocal cords. The laryngoscopy is done to see if the vocal cords are moving normally. Blood hormone studies: A procedure in which a blood sample is checked to measure the amounts of certain hormones released into the blood by organs and tissues in the body. An unusual (higher or lower than normal) amount of a substance can be a sign of disease in the organ or tissue that makes it. The blood may be checked for abnormal levels of thyroid-stimulating hormone (TSH). TSH is made by the pituitary gland in the brain. It stimulates the release of thyroid hormone and controls how fast follicular thyroid cells grow. The blood may also be checked for high levels of the hormone calcitonin and antithyroid antibodies. Blood chemistry studies: A procedure in which a blood sample is checked to measure the amounts of certain substances, such as calcium, released into the blood by organs and tissues in the body. An unusual (higher or lower than normal) amount of a substance can be a sign of disease. Ultrasound exam: A procedure in which high-energy sound waves (ultrasound) are bounced off internal tissues or organs in the neck and make echoes. The echoes form a picture of body tissues called a sonogram. The picture can be printed to be looked at later. This procedure can show the size of a thyroid nodule and whether it is solid or a fluid-filled cyst. Ultrasound may be used to guide a fine-needle aspiration biopsy. The age of the patient at the time of diagnosis. Whether the cancer was completely removed by surgery. Whether the patient has multiple endocrine neoplasia type 2B (MEN 2B).